Boy Meets Dinosaur, originally uploaded by B.K. Dewey. 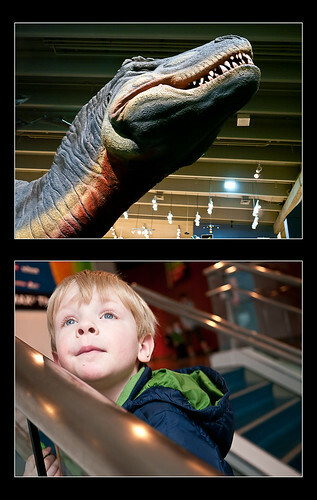 One of our adventures in St. Louis was the Science Center. In the basement, they have a life sized animatronic Tyrannosaurus Rex, which had just killed a life-sized Triceratops. It’s amazing how BIG these creatures were. When you stand under the T. Rex, you just feel small. When you walk down the staircase to get to the exhibit, though, you’re level with the T. Rex’s head and he’s staring right at you… THAT’s scary, even to an adult. Alex didn’t linger on the stairs!